Screenshot from video 44, showcasing Chuggaaconroy's battle against Cynthia. Since 2008, Emiliano "Emile" Rodolfo Rosales-Birou (a.k.a. "Chuggaaconroy") has made a career doing Let's Plays (commentated walkthroughs of video games) and is currently one of the most famous internet personalities of the genre. Aside from regular playthroughs, his earlier videos sometimes consisted of one-offs, in which he would show single aspects of certain video games that caught his attention (i.e. cut footage from playthroughs, glitches, or limited edition DLC & offers). Among these one-offs was a series of 88 videos showcasing events in the Nintendo DS game Pokémon Platinum, recorded using a camcorder (as no capture cards for the Nintendo DS existed at the time). 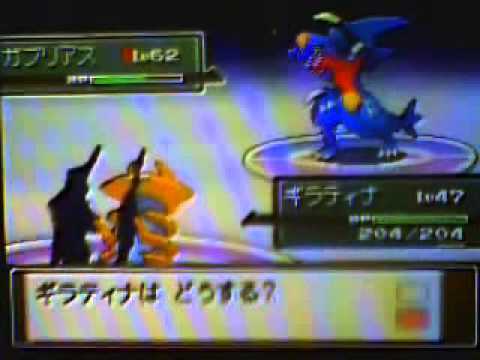 These videos showcased every major battle in the game, both with Pokémon trainers and Legendary Pokémon. Because Platinum had not been released in the United States at the time (the videos were recorded in 2008; Pokémon Platinum was released in the US in 2009), the footage used was of the Japanese version. Uniquely, the most popular videos showcased a series of events that would allow one to encounter (and potentially capture) its various Legendary Pokémon, most notably Regirock, Regice, and Registeel. Said Pokémon were the secondary trio of Legendary Pokémon from the 2002/2003 Game Boy Advance games Pokémon Ruby & Sapphire and its 2005 re-release, Pokémon Emerald, and could only be caught in Platinum through limited-edition downloadable content. At some point, the videos were made private, causing them to be visible to only a select number of viewers, and they were eventually deleted. According to Chuggaaconroy in the December 18 announcement video for his 2015 Pokémon Platinum lets play, the videos were primarily made as a way of answering general questions about the game when it was still new and were a method of figuring out "what exactly [he] wanted to do in the way of videos." Because he was never too fond of how the videos turned out, he eventually deleted them, with his 2015 LP of the game being made to fulfill his wish of doing a proper playthrough of it. The first of Chuggaconroy's videos to resurface was a mirror upload of his encounter with the rare Pokémon Rotom on August 6, 2011, by ChuggaaArchive. The next bout of recovery wouldn't occur again until June 18, 2015, when a YouTube user by the name of "AquaRing" created a playlist containing mirror uploads of five of Chuggaconroy's Platinum videos. The first three document his battle with Champion Cynthia, the fourth shows off the in-game Distortion World event, and the fifth his battle with the Legendary Pokémon Regigigas. The complete playlist can be seen here. According to AquaRing, these five videos are the only ones that they were able to recover. Despite Chuggaaconroy's dissatisfaction with the Platinum videos, he eventually reuploaded all 88 of them on his YouTube channel on July 15, 2016. According to his announcement of them on Twitter, he had decided to bring back the 2008 series due to strong fan demand, a move that was met with positive reception. His complete playlist of this once-lost series can be seen here. The announcement video for Chuggaaconroy's 2015 Platinum LP, in which he discusses the lost videos. Mirror upload of the Rotom video from his 2015 Platinum series.